Kauai Zip Line Tours are some of the most popular ways to spend your Hawaiian vacation. Top Ten Hawaii offers a variety of Kauai Zipline Tours such as the Kipu Falls Zipline Trek and those offered through Kauai Backcountry Adventures, Outfitters Kauai, and Princeville Ranch Adventures. When you book your Zipline in Kauai adventure through Top Ten Hawaii, you’re sure to save both time and money. Kauai Backcountry Adventures features an out of this world Zipline in Hawaii tour that features an incredible total of seven ziplines! This Kauai Zip Line Tour truly is perfect for the whole family, and it’s sure to create lasting memories that you’ll love sharing with your friends and family back home. This Kauai Zipline Tour will bring you deep into the island, through what was once a sugar plantation. You’ll travel down a stunning mountainside until you reach the first zipline. Then you’ll cruise over a mountain stream, on to a bamboo grove where you and your companions will indulge in a picnic lunch and a refreshing swim. Safety is the first priority when it comes to Zipline in Kauai with Kauai Backcountry Adventures. This company uses only high quality equipment that is regularly maintained and inspected. The Zipline in Hawaii course is approved for use by the renowned Association for Challenge Course Technology. Nothing can compare to jumping off and cruising over the jungle, enjoying the views of gorgeous waterfalls and streams below. A maximum of eleven participants are allowed to participate in this Kauai Zip Line Tour so that overcrowding doesn’t become an issue. Outfitters Kauai offers several Kauai Zipline Tours such as the Kipu Falls Zipline Trek. This Zipline in Kauai adventure brings you to glide on ziplines through the forest’s canopy above majestic waterfalls and rivers. During the Kipu Falls Zipline Trek, you’ll also be able to enjoy swimming, hiking, and a rope swing! Simultaneously, you’ll be learning about Kauai’s natural history, ecology, legends, and culture. There are four different ziplines involved in Outfitters Kauai’s course. These lines are operated and were designed by the highest safety standards set by the experts at ACCT. This Zipline in Hawaii adventure takes place at Kipu Ranch, a 4000-acre piece of land that isn’t open to the general public. Outfitters Kauai’s land runs from Hoary Head Range’s highest mountaintops through lush meadows down to the jungle stream’s edge. Following a safety briefing by one of the company’s certified guides, you’ll travel from top to bottom through the forest’s canopy on elevated walkways, ziplines, and suspension bridges. The Kipu Falls Zipline Trek lasts for about 4 ½ hours. 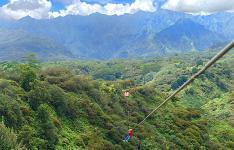 One more Zipline in Hawaii tour is the Princeville Zip and Dip offered through Princeville Ranch Adventures. This Kauai Zip Line Tour features one suspension bridge, eight zip lines, and an hour spent at an isolated swimming hole where a delicious picnic can be enjoyed. Princeville Ranch Adventures also offers the Zip Express as well as other Kauai Zipline Tours for you to choose from. When you’re booking your Hawaii activities through any of the Top Ten Hawaii partners, don’t forget to ask about the various Kauai Zipline Tours offered through companies such as Kauia Backcountry Adventures, Outfitters Kauai, and Princeville Ranch Adventures.